Hino Trucks has expanded its INSIGHT platform. The entire platform will be standard fit across all 2017 model-year models. Hino Trucks has expanded its INSIGHT platform. The expansion delivers three services to owners: INSIGHT Telematics — powered by Telogis, INSIGHT Remote Diagnostics (INSIGHT RD) and INSIGHT Case Management (INSIGHT CM) — powered by Decisiv. The entire platform will be standard fit across all 2017 model-year models. 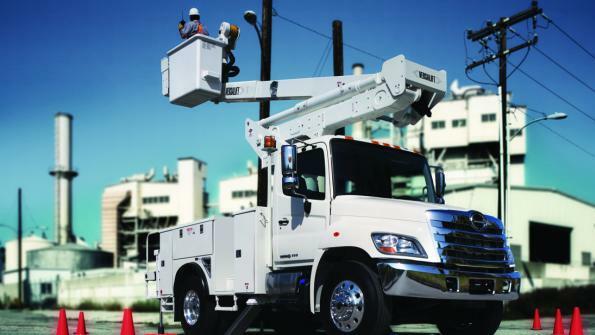 According to the company, Hino is the first OEM to provide Telematics, Remote Diagnostics and Case Management as a standard feature. Hino INSIGHT Telematics powered by Telogis delivers real-time mission-critical data to customers on vehicle and driver performance to help them lower total cost of ownership and improve operational efficiencies. Additionally, INSIGHT Telematics provides Hino-specific functionality like diesel exhaust fluid (DEF) level, regen activity and peer benchmarking. Electronic Driver Vehicle Inspection Reports (DVIR) service is also included as part of the first year of service. INSIGHT Remote Diagnostics, provides real-time notifications to customers, dealers and Hino of active diagnostic trouble codes. This integrated diagnostic software reduces downtime for critical repairs by providing standardized repair instructions and required parts list, according to the company. The software streamlines the service process by locating the nearest dealer with availability and parts on hand. INSIGHT Case Management picks up these codes and provides start-to-finish communication updates during the service event process by using software and personnel at Hino Trucks Diagnostic Center to analyze and create a plan to address the trouble code. A customer is able to see the different stages of the repair process. The system ensures quick response time for approvals and notifications, and reduces downtime for service and repair events. Additionally, INSIGHT Case Management will provide automated reminders for planned maintenance so the customer can schedule a maintenance appointment at their convenience. All 2017 model-year conventional and cab-over Hino trucks will have the INSIGHT platform standard across all models and includes a one-year subscription to INSIGHT Telematics, and five-year coverage for INSIGHT Remote Diagnostics and INSIGHT Case Management. The value of INSIGHT strengthens the firm’s commitment to providing the lowest cost of ownership throughout the ownership lifecycle. Hino Trucks, a Toyota Group Company, assembles, sells and services an environmentally friendly lineup of Class 4-7 conventional and cab-over commercial trucks. Headquartered in Novi, Mich., Hino has a network of over 200 dealers nationwide committed to achieving excellence in customer service and support.